As an online entrepreneur and a digital nomad at the same time, there is one “thing” that my business can’t live without: my team. While I used to do everything myself (working inside my business instead of on my business), I’m truly happy that I started building a good team a few years back. It’s called a “virtual team” since they’re all at other places – meaning all our communications are digital. We don’t see each other in the office, like most teams do. So how do you manage a virtual team like that? Well, there are no strict rules in managing a virtual team; I have my own approach while you might have your own. My approach is to keep it personal (by connecting with every team member on a personal level), while also have very clear processes and systems in place to prevent unnecessary going back-and-forth about everything. For me the biggest breakthrough was to let the team be a team. Empower them to work together, instead of trying to be the center in your team. In other words – trust them to do it right – and let them send their work to the next person (e.g. from the copywriter to the designer) without double checking every little detail. However.. instead of focusing how I would manage my team, I wanted to change it up a bit. 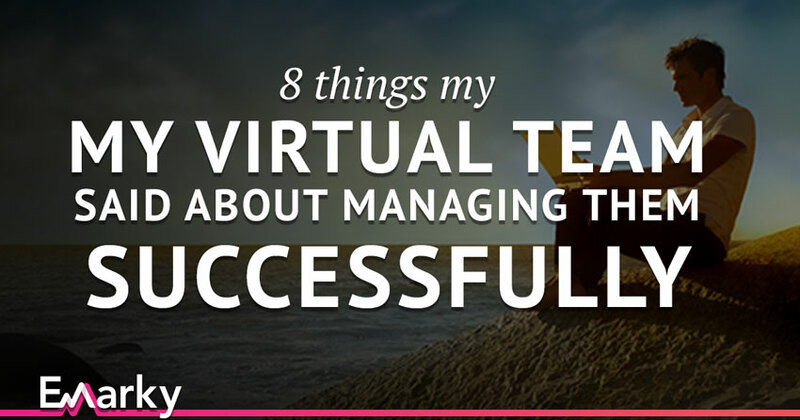 I’ve asked my team to write this post for me to find out what they think is most important to manage a virtual team successfully. So… the rest of this article is written by one of my team members. Go for it! 5. Run effective virtual team meetings. Interesting, right? I thought it was, at least. Based on what you read above, do you have any suggestions or thing you agree or disagree on? Let me know in the comments below!